Good morning. 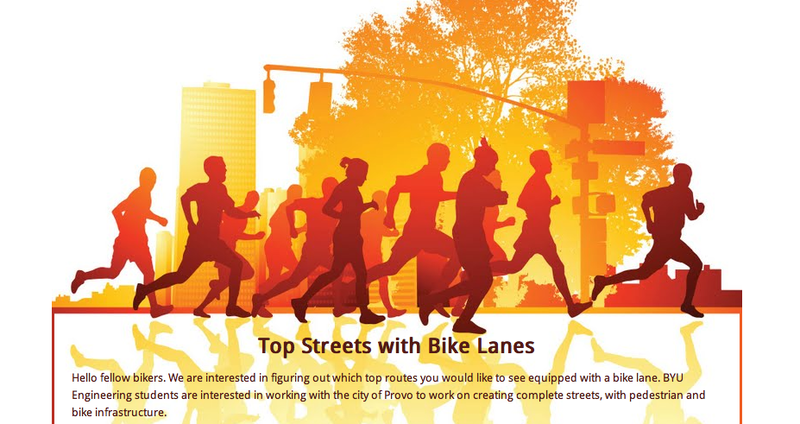 Looks like the Provo Bicycle Committee has a survey going around to help prioritize where new potential lanes are going. If you want safer more rideable streets in Provo take a minute and mark down the top 10 roads in Provo that you would like to see with bike lanes. This is going directly to Provo City and a group at BYU that is helping with some connectivity analysis. If you are looking for the easiest way to make a difference it does not get any easier than this. . The survey is due on Thursday afternoon so don’t delay. You can find everything here. Also make sure to share this on all the different interweb outlets Facespace, twittle, electronic mail, etc. 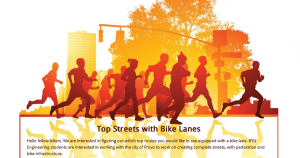 This entry was posted in Bike Advocacy, Bike Paths, Provo Bike Committee by Zac. Bookmark the permalink.